Reu taking a ‘Walker’ on the inside. Unpopular opinion, I have never been a huge fan of the Star Fox series. I mean, I have played most of the games, and enjoyed playing them, but the series never grabbed me in the way that say Metroid or Zelda did. However, even I was excited to play the new entry into this iconic franchise. The jump (flight) of Fox, Peppy, Falco and Slippy into high definition was something that I had to play. I must admit that this game is now a must-buy. With the screens giving a separate cinematic view and a cockpit view, I must admit that it gets confusing to know where to look, but once you get it (or swap the screens around – or have the cockpit view on the big screen – like I did) the game becomes wonderfully engaging and intuitive, especially with the gyro controls for the aiming reticule. This part is the most interesting aspect for me, as the precision you can get with aiming with the gyro, even at this early point, is astounding. I should also say that the game, even at this demo stage, is absolutely breath-taking. Even flying around the often-seen fields and cities of Corneria feels wonderfully fresh and simultaneously nostalgic. 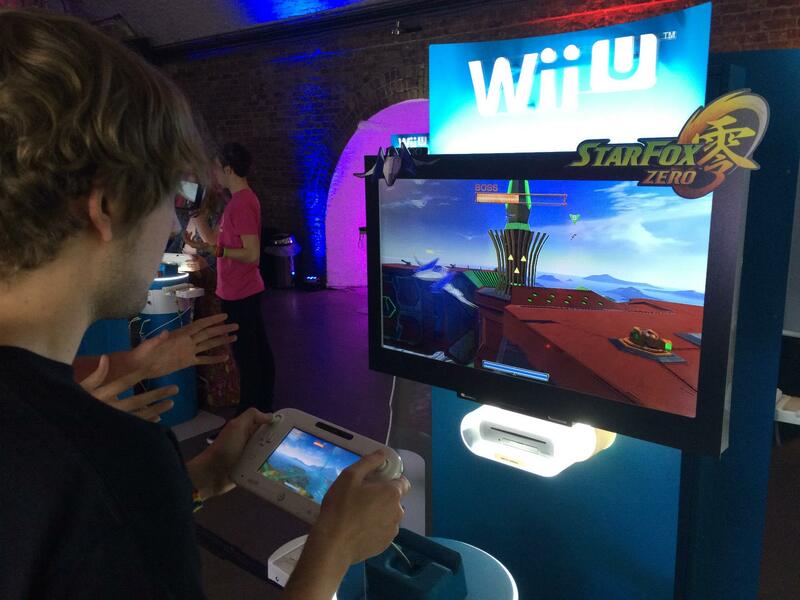 If this demo is just a taster for what is to come, I think StarFox Zero is now a day one purchase. Me being caught in the act mid vertical loop! Aaah Starwing (yes PAL I’m stubborn!) yet again you don’t disappoint. Ladies and gentlemen here’s the missing Wii U title which finally bellows, “NOW LOOK HERE! I’VE BEEN LOVINGLY TAILORED TO COMPLIMENT DUAL SCREEN COMPANIONSHIP… HONEST!” Agreed. ‘Bout time the console’s pack-in controller shook its fluffy optional status. During my time with Star Fox Zero the upward-to-downward-back-to-upward visual concentration felt seamless and darn right essential. The big screen casting a fuller visual net for the dogfighting draw distance whilst the GamePad cockpit bringing the necessary finesse to the “I’m actually amidst it all” blasting. What I previewed was epic enough to warrant multiple demopod visits, it played oh so well. For us fans all that maneuver training won’t need resetting here, more rather adjusting to the new control scheme and accommodating the second screen. Remember the branching in-level and overworld level pathways? Well there back too, and in the demo’s case blasting openings to then pilot inside the boss to blow it to pieces from within. Whopp a new fangled cinematic view on top of the chaos, did I already say epic? Get pumped for this Stax Foxians and fellow anthropomorphic Sci-Fi enthusiasts it’s going to be grand! I would confidently say I knew what to expect with Star Fox Zero – and I certainly wasn’t disappointed. Straight into that all (perhaps too) familiar on-rails fly across the plains of Corneria and I was home – shooting at the doorways to make them open, cutting just in front of obstacles to narrowly avoid crashing and collecting hard to reach rings, shooting at ships as they flew towards me and across my path – fantastic familiar gameplay with a new glorious looking HD sheen and those classic sound effects. But there’s more too it than that. The controls are unfamiliar to being with – the right analogue stick is used to tilt and fly on your side and to barrel roll, plus, push forward to speed ahead and pull back to slow down. Tilting the gamepad to move the reticle around, AND using the left analogue stick to move your Arwing around the screen, all combined to feel a little confusing to be honest. A second play through was all it took for me to feel in control though. Then I was into all-range mode, defending a tower as it was being attacked from all sides by an army of four legged creatures. These guys were relatively easy to destroy – a charged shot launches after keeping your finger on the fire button for a couple of seconds. But the cinematic I was watching on the TV screen meant aiming was tricky. Until, I was encouraged to take a look at the gamepad screen to utilise the cockpit view. First person, precision aiming then became the way to play, and what a joy it was to behold. A quick tap of the minus button switches the view to the TV, swapping screens, and so the primary objective of shooting the enemies can be enjoyed at full size. Initially a daunting prospect; I’m happy that choosing which screen to view at the right time will soon become second nature, albeit with a lot to take in at once. Ahead of E3 this year, Star Fox was my most anticipated Nintendo title. For Wii U, and other than Zelda of course, I can happily still say it is. I do want to see all new locals, as well as some old favourites though; but those meteor storm sections are going to be amazing. It’s been a long time since we’ve been able to jump into the cockpit with our furry friends – almost nine years in fact after Star Fox Command for the Nintendo DS. Star Fox isn’t a series I’m familiar with; I’ve put about half an hour into Lylat Wars and that’s as far as my experience goes. It’s likely to be one of the last games that Nintendo EAD develops for the Wii U system, being aided this time by Platinum Games after their great success with Bayonetta 2. So things are looking up for the anthropomorphic space pilots already, and the game did not disappoint; it was a delight to soar over Corneria’s fields, below bridges and around a tower in the Arwing. The gyro controls felt smooth, and I appreciated the freedom of flight that was offered. The Corneria level started with a more linear path before opening out around a tower, where I was able to move freely where I wanted. 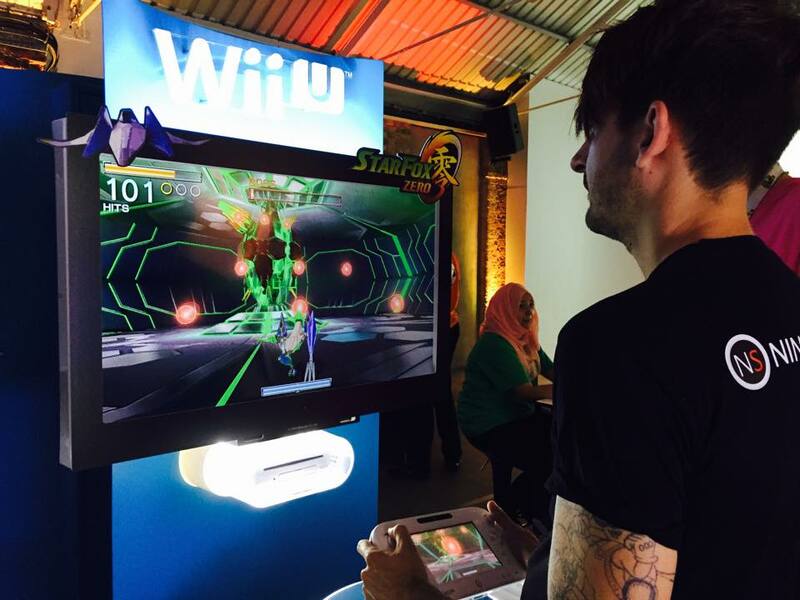 The Gamepad showed a cockpit view, which made for more accurate shooting particularly for the boss battle. The TV screen took a more cinematic view for the final encounter and essentially forced me to use the Gamepad for precision aiming. It didn’t take me long to get used to the dual-screen setup and it’s been well utilised. I loved that there were multiple methods to dispatch the boss ship as well; by transforming the Arwing into a land vehicle I could enter the ship and destroy it from the inside. The other level on offer was a dogfight affair in space, and again the controls felt natural. Somersaulting to get behind an enemy before shooting them down was immensely satisfying. Time will tell but Fox and co looks to be on a winner. Let’s hope they succeed! 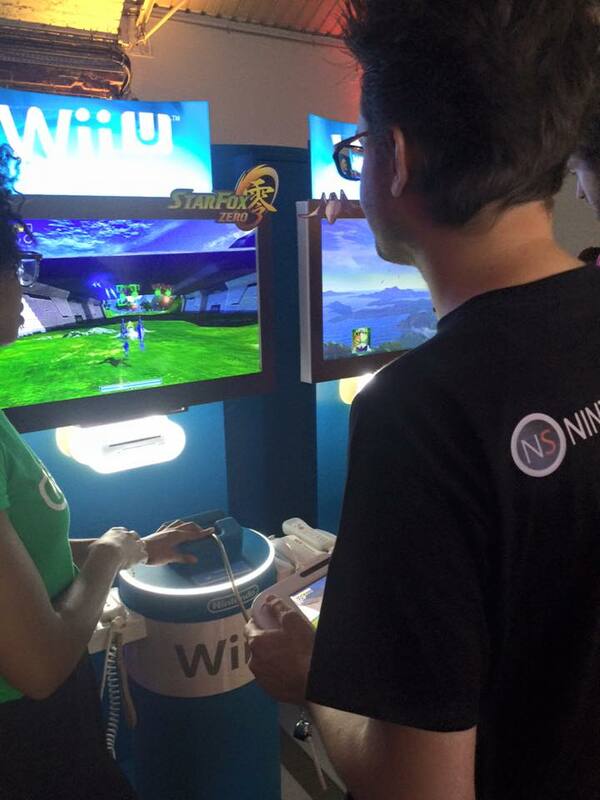 All the above opinions are based on the demo build of Star Fox Zero on show at 30/06/15 – 01/07/15 gameplay and content is subject to change.